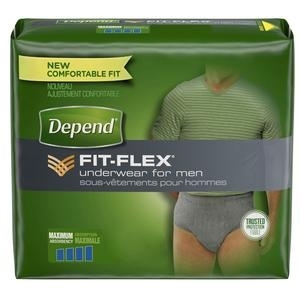 Depend for Men underwear is specially made for a man's body. Soft, quiet and breathable, they're easy to use -- just pull them on and off. This product uses a thin, absorbent pad made of super absorbent polymers that draw wetness in, away from the skin, helping to lock in urine and odors while helping to keep skin dry. Smooth waistband for a soft and comfortable fit. Specifically designed to absorb liquid fast for outstanding comfort. Maximum absorbency that locks in odor for day long confidence. With lycra strands for complete freedom of movement. Protection while active -- flexes with the leg. Brief-like leg openings help protect against leakage and provide snug comfort like men's underwear.